SC1 (SOFT) The new compound of the softest solution on the front is the V0952 spec which has been the go-to option for the last two years in the World Superbike Championship and last year in a few prominent national championships such as British Superbike, CIV, CEV and Alpe Adria. This compound was developed to provide better performance and riding precision, as well as more versatile use. SC2 (MEDIUM) The new medium solution is sturdier and quicker in direction changes, also guaranteeing more support, better grip, maximum lean angle and better absorption of the bumps on the track. SC3 (HARD) The new standard SC3 compound provides better precision and quickness in direction changes and more support than the previous standard compound. Generally, the SC3 has the same or more grip than the SC2, but a higher capacity to resist wear than the other solutions. SCX (EXTRASOFT) in 200/65 - This is a completely new product in the range, available to the FIM World Superbike Championship riders. This solution, which uses an extremely soft compound, was designed to fall between the performance of a qualifying compound and that of a soft racing tyre. It will therefore be possible to use it as a pre-qualifier in order to prepare riders and bikes for the challenge of the grip provided by the only qualifying tyre available for the timed session. It will also come in handy in the event of a red flag to finish out the remaining laps of the race after a second start, being able to count on extra grip compared to the compound chosen for the race. The last purpose of the project, once it has been suitably developed, is to be a competitive solution for the 10-lap Sprint Race on Sunday morning, providing one more competitive instrument in the strategic choices for each rider and team. SC0 (SOFT) This new soft compound provides more of a push when opening up the throttle coming out of corners, as well as being more consistent over race distance and increasing the range of use in critical conditions (typically in cold temperatures), maintaining the same hot performance as the previous SC0. SC2 (HARD) The new SC2 compound uses theX0639 spec with which Pirelli took 1st and 3rd place in the Bol d’Or stock class. This solution offers better grip, especially at full lean and going through corners, as well as improving coming out of the turn. It also guarantees better consistency over race distance and is a very versatile solution in terms of operating temperatures. In addition, for Superpole®, the World Superbike riders and all those who participate in national championships that have a Superpole® session, will continue to have aSupersoft Superpole® tyre available to them which is capable of guaranteeing maximum performance on the flying lap. ​PIRELLI DIABLO RAIN There is even news in the rain tyre department. Specifically, Pirelli has worked to improve performance of the rear tyre in the 200/60 ZR 17 size and in two different compounds. 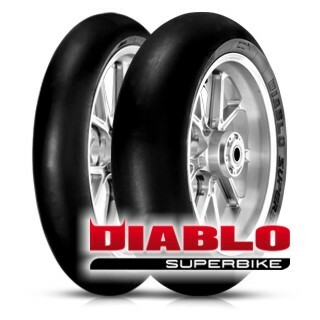 PIRELLI DIABLO WET IS A TYRE EXCLUSIVELY FOR RACETRACK USE, IT CONSTITUTES A DIRECT LINK BETWEEN SPORTING USERS AND THE WORLD OF PROFESSIONAL RIDERS. The official tyre of the world Superbike championship dedicated to professional riders and to sporting users who are looking for top performance on intermediate surfaces. The compounds and the tread pattern are designed to ensure the maximum traction and precision in conditions of damp / wet asphalt. Excellent stability and grip at any angle of inclination, with constant performance lap after lap for the entire duration of the race.